Facts are an antidote to nonsense like “The Comeback Country – How America pulled itself back from the brink—and why it’s destined to stay on top” (by Daniel Gross, Newsweek, 9 April 2010). The stabilization and slow recovery of the US economy has resulted from extraordinary government stimulus. With a cost: $536 billion in new debt so far in 2010, through April 9 (source). While successful, it’s not something to rejoice about — or ignore (as does Gross). 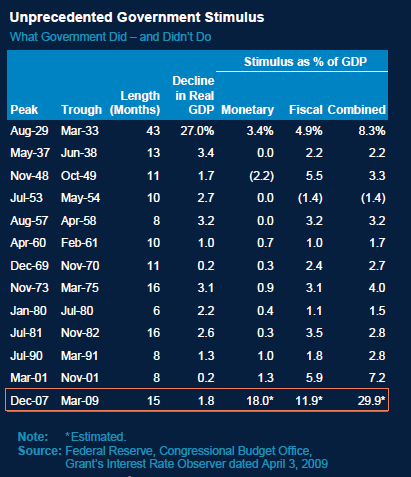 This graphic tells the story, from a Morgan Stanley report of 12 April 2010 (via Scribd). Previous Post How useful are our intelligence agencies? To what degree are they blinded by prejudice and institutional needs?